This evening, my friends. This final evening in Sarajevo was what travel dreams are made of. You know the kind I'm talking about? The kind that you reflect upon with edges made fuzzy by a little too much wine, a whole lotta sweetness and laughter and good food and so. much. dang. clarity. that you feel as blown away as you feel grounded. Am I making any sense at all? Let's take a step back. You might not remember where we last left off, because I last left off... light years ago. In short, we had spent our final day in Sarajevo gorging on so much food we could barely breathe, and souvenir shopping in Old Town in an attempt to work off some of those calories. By late afternoon, the sun was out and shining for the first time in days, our feet were aching, and we still had a couple of hours until our dinner reservation. What to do, what to do. Cassandra had the perfect idea! The rooftop of Hotel Hecco Deluxe, a nondescript hotel hidden away at the edge of Old Town, right next to the Eternal Flame. Head inside, take the elevator to the ninth floor, and then walk up one more flight to the hotel cafe. Likely the best kept secret in Sarajevo: the views here are unbelievable, and you would never know it just walking by the place. 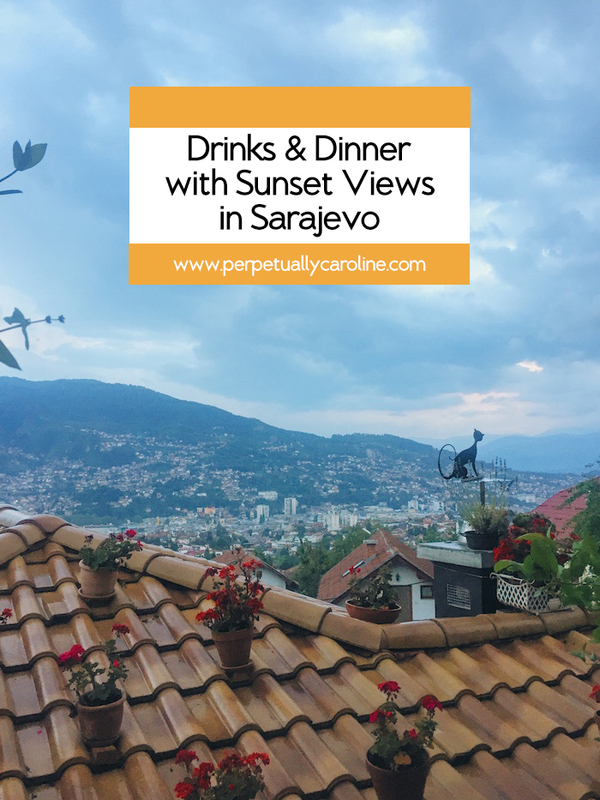 The outdoor patio of the cafe wraps around the entire building, so you can enjoy sweeping views of Sarajevo from every perspective. Absolutely breathtaking. We hid up there, letting the sun bathe our vitamin D deprived selves, sipping sinful iced Nescafe drinks topped up with caramel and hazelnut and whipped cream and chocolate and all the most delightful things ever. Fifteen minutes into admiring the view and our frothy frozen drinks and each other's company, the sunny skies opened up and started POURING. Incredulous at the way the weather could care less about our picture perfect afternoon and grabbing the shopping bags at our feet, we rushed inside with our drinks, cackling hysterically and shaking our heads at our luck. After slurping up the last of our icy drinks, we squeezed into a taxi that wove its way full speed up the hills and to the front door of Kibe, one of Sarajevo's finest restaurants. The ambiance of this place is unreal: shielded by wooden awnings but still dining in the open air, you feel like you're in someone's (very VERY nice) private courtyard. Ivy climbing wooden posts, warm blankets on the back of every chair to guard against the evening chill, flower pots dotting the rooftop, and a lamb roasting away on a spit in the corner, it's the perfect place to enjoy a slow meal. It's also fancy AF. You order each course via iPad, aided by waiters who have obviously received ages of technical training. Can you see that lamb roasting away in the corner? Our waiter swung by with a basket of fluffy bread and sharp cheeses to start us off. Then, platter after platter of steaming goodness. From marinated red peppers, blistered juuuuust so that they're lightly charred and drizzled with a generous pool of olive oil–to čušpajz, which is seriously the most delicious creamed spinach I've ever tasted–to these homemade minced meat dumplings that we glared at each other over, each trying to steal the last bite. Savoring each bite, we let our eyes wander towards dusk settling in, attempting vainly to capture that exact moment: candles lit, twinkling lights twisting and snaking far off into the distance, cheeks rosy from the wine and the giggles. And though we were in a frick ton of agony from all that we'd eaten, we declared ourselves not to be quitters and bravely polished off every last morsel of the lamb roasted on the spit and the crispy potatoes that came with them. I do have to mention that the service at Kibe was so special. Our waiter was extremely kind and attentive, making sure that our wine was overflowing and recommending his favorite dishes. At times, he couldn't stop chuckling at our strange antics, ducking his head to hide his laughter whenever we asked for another bottle of wine with a "wine not??" or asked yet another ridiculous question, and he didn't bat an eye when he caught Leah and Hanna racing Cassandra and me in seeing who could be the fastest to finish our dessert. The winner? Well, while Cassandra and I won in finishing our plate first, Leah and Hanna declared themselves the true winners as they still had more to enjoy while Cassandra and I could only look sadly at our spotless plate. And that dessert? When we couldn't choose between ice cream, kadaif ("pastry threads soaked in syrup and walnuts"), humadžik (a date pastry also drenched in syrup which was DELICIOUS and which we lovingly refer to as "butter sugar flour" because the waiter taught us how to make it and that's literally all you need apparently), and apple pie–he created sampler plates with a little of each for us. And then when we expressed curiosity in the different flavors of rakija (straight up HARD liquor), he brought us shot after shot of his favorites (on the house! ): cherry visjna, honey, and pear. Yum to the first, BLEGH to the other two. Plus he brought over a glass of dessert wine for us to try, just for fun. The generosity we received from Sarajevans, I can't even begin to tell you. You would think that after a whole day of nonstop eating, we wouldn't touch another crumb for like four months. However, when faced with the reality that at least Leah and I likely wouldn't have another bite of authentic cevapi for a long, long, long time, we completely panicked and started sprinting down the hill from Kibe towards Old Town. We knew that this one little cevapi place, Petica, was open until 11PM and at this point, it was 10:45PM, with a ten minute walk still ahead of us. We started sprint-walking, avoiding cars hurtling past and stray dogs lying about menacingly, our bladders threatening to burst because remember, we literally bolted from the restaurant when we realized the time. We arrived at Petica with minutes to spare. The waitress nonchalantly asks us "a small portion?" to which we smirked and answered, "two large portions, please!" and sure enough, we ate every. single. bite. This isn't amateur hour, y'all. In the dead of night and en route to Cassandra's apartment in the outskirts of town, we stopped at a bar to listen to live music and to drink some cider... until the food coma really and truly settled in, at which point we booked it out of there and walked the miles home with bulging stomachs alongside the river, followed by yet another stray dog. The theme of Sarajevo: generous people, stray dogs, AMAZING FOOD. Have you ever been? Would you ever want to go? Pleeeeease let me know if you're ever on your way there – I'd love to pass along some recommendations!